Better ergonomic and lighting fast detecting bugs! BugHunter BH-03 is an easy operated detector for very fast detection of spy devices in frequency range from 10 to 3500 MHz. Detects digital and analog bugs simultaneously without altering settings and switching to different operating modes. It reduces statics from cell phone towers. 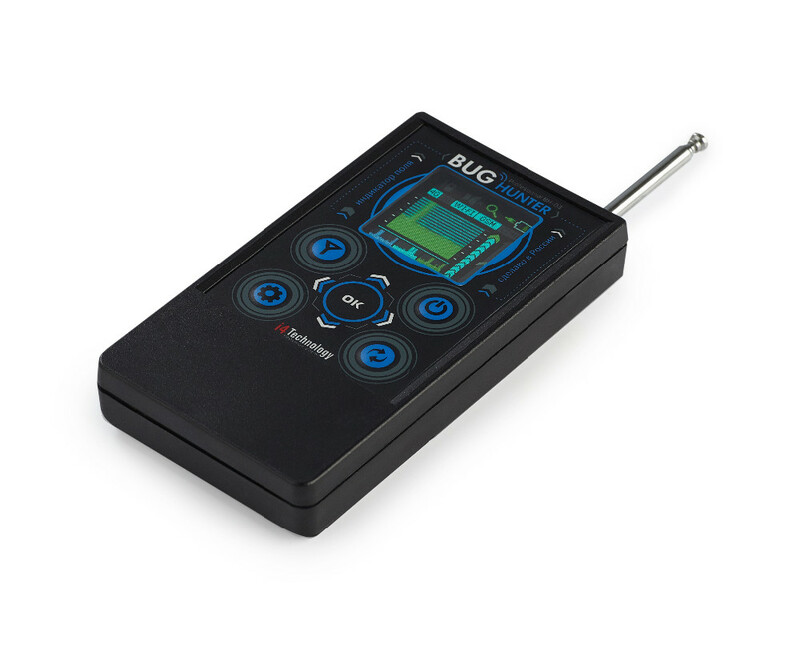 BugHunter BH-03 has very informative OLED monitor that displays all the necessary data and allows being in complete control of the situation at any time. It suits those who are not tech-savvy because its operation is very comprehensive, one can search 'bugs' with one touch! It is very handy and convenient with a weight of only 110 grams (3.9 oz). Detects almost any spy device! 1) Fast search of bugs at a touch. 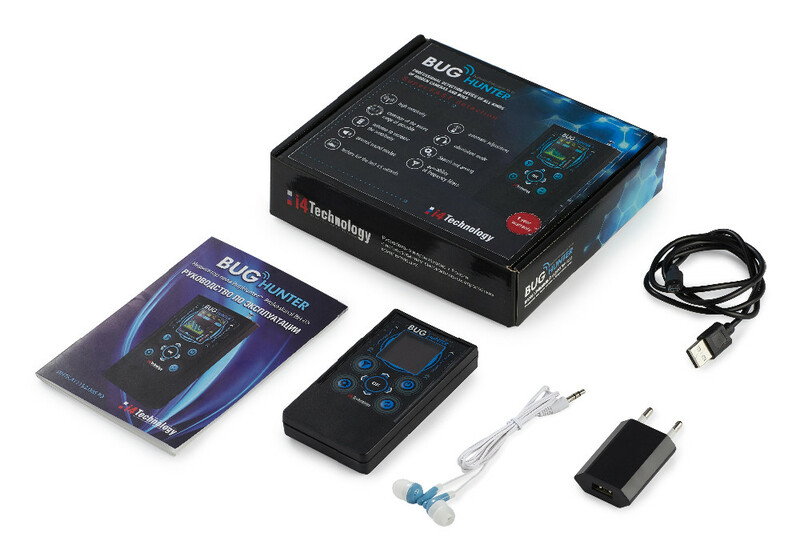 BugHunter BH-03 is one of the most tech and fast detectors. It can find a bug in just a few seconds! 2) Detects digital and analog bugs simultaneously without altering settings and switching to different operating modes. The detector has advanced quick-operating microprocessor to detect even modern bugs (for example those transmitting data by short pulses and invisible for most other anti-spy bug detectors). It’s also important that the device can “see” digital and analog 'bugs' at the same time. 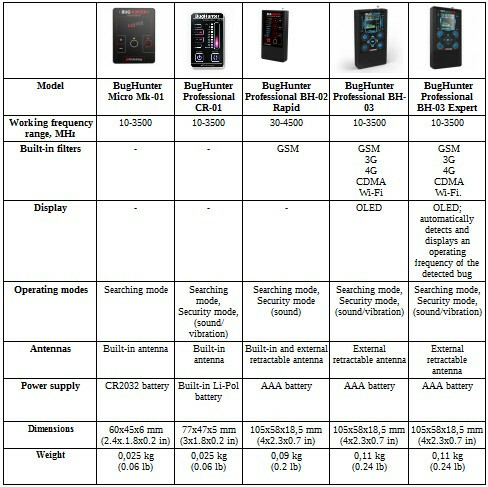 3) Unique built-in GSM, 3G, 4G, CDMA, Wi-Fi, GPS filter. If the environment has some sort of extraneous background frequencies that interfere to search – just filter them out. 4) Visual multicolor OLED-display which shows all the necessary information: type of the received signal (analog and digital at the same time), history of changes in the last 45 seconds in clear graphics, modes pictogram, filters condition etc. It allows being in complete control of the situation at any time. 5) Coverage of the entire frequency range used by the most wireless "bugs": from 10 to 3500 MHz. 6) Registration of record high dynamic range (70 dB). 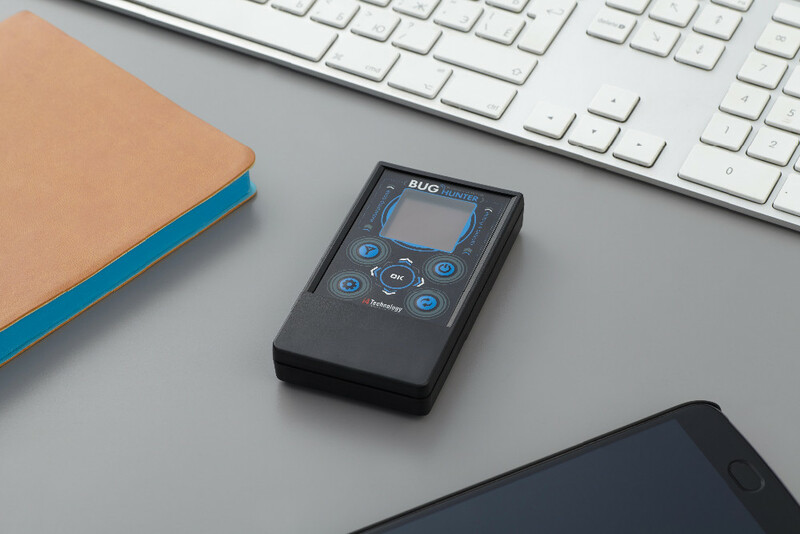 For example BugHunter BH-02 which holds a leading position among similar devices for wide dynamic range and is considered one of the most efficient and sensitive has only 48 dB. The higher the dynamic range is, the better is the detection of devices with very high and very low power radio transmissions. This is very important in difficult conditions when there are both powerful signal sources (cellular phones) and weak signal sources (almost all types of bugs). Detector with high dynamic range will not read off scale and will find hidden bugs against a backdrop of cellular signal. • Exact match of stated parameters. • Equally high sensitivity throughout claimed frequency range. It is unique! • Both analog and digital wireless "bug" detection (short pulses)! • Automatic adjustment of background radiation levels. • Extended operating temperature range. • Headphones connection for implicit warnings of wireless "Bugs". • Advanced power saving features (increased duration of work). • Low battery indicator. Automatic cutoff function to save energy.